The making of: KEF LS50 Wireless | What Hi-Fi? In our review of the KEF LS50 Wireless, we said they “sound at least as good as the best comparable separates combinations available”. That’s one of the reasons they were entered into our Hall of Fame at the 2017 What Hi-Fi? Awards. And they've since spawned the equally-impressive but more compact, KEF LSX. KEF’s motto may be “obsessed with high-resolution”, but with these new all-in-one streaming speaker systems, the company is trying to alter the way we view the hi-fi system. The British speaker manufacturer aims to replace the traditional stacked racks of components with a pair of feature-packed speakers. The KEF LS50 Wireless is an all-in-one streaming system, combining source and preamplifier into a pair of active speakers. Essentially, KEF has upgraded the brand’s LS50 speakers and brought them into a convenience-focused, streaming-centred domain. Jack Oclee-Brown, KEF's head of acoustics, talked us through the process of developing the LS50 Wireless system – and the challenges they had to overcome along the way. 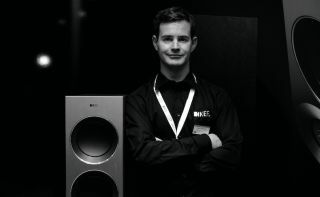 Jack Oclee-Brown, KEF's head of acoustics: “People love hi-fi, but they say, ‘I can’t afford it’. The KEF LS50 Wireless delivers sound quality a hi-fi enthusiast would be happy with - but it’s also for people who aren’t into hi-fi, but still want the hi-fi experience. There are lots of companies exploring this avenue and we’re doing it in our particular way. “We were clear we wanted it to be digital signal processing (DSP) – and if it’s going to be DSP, why not put a streamer in it? That way you can make it easier for the sound to be adjusted to suit your room. There are a lot of active speakers in the pro market that have tiny switches on the back, but that’s not our customer. Having a phone app that can walk people through the process opens up a lot more possibility. “We didn’t change the driver or box acoustics, which was a good decision but a strange one. Why should an active speaker have the same as a passive one? We thought, ‘this is what we’ve got at the end of the chain, how can we extract the maximum from that? How do we optimise our electronics?’ You use your own product to set your sights on something. If we could, maybe we’d change the drivers and make them floorstanders. “Anybody who designs speakers wants to design active speakers rather than passive, because you can get them to sound better. Although most of our products are passive, we do a lot of in-house development of drivers ourselves, so we have a lot of simulation tools. "But there aren’t programs you can buy off-the-shelf to simulate loudspeakers, so we had to have programming knowledge. From that, we’re comfortable going from a passive crossover to an active, which we’ve been doing for the KEF Muo and some of our digital subwoofers. “This is simply opening that [development] up, and doing it with a proper speaker. We have stuff in there that you just can’t do passively, like timing correction on the impulse response. When the signal is split into high and low frequencies, the signal comes out slightly smeared – something you can’t really avoid with a passive speaker. With DSP, we can almost perform a reverse smear – if you know the crossover and speaker is going to blur it, we can calculate a reverse blur that tries to undo it. “The speaker that can play as loud, and has as much bass, as anybody ever wants is huge and expensive. So even for something like the LS50, it’s all about choosing your compromise – bass or maximum output. We’ve been doing passive speakers for 55 years, and are comfortable about where those decisions should lie. “You get a feel for the compromises that work for certain products. We have custom-install products, rugged outdoor speakers that cannot break - so you’re more willing to accept audio compromises than you would be for a normal speaker. It’s challenging when you move into a product category you aren’t familiar with. The Muo was tricky, as we didn’t have any precedent there. “The LS50s’ baffle has been very carefully designed. The curve is the best shape for sound radiation and it doesn’t disturb the sound flow. In the 1960s, acoustic engineer Harry Olson figured out a sphere would minimise this. But spheres are the worst shape for internal resonance, so again, it’s all about compromise. The LS50 can be that shape because it’s small. The KEF Blade’s shape is great for diffraction, but putting LS50 drivers in that wouldn’t work." “At KEF, we’ve been into streaming for a while. I joined in 2004, and we were playing around with streaming systems when internet radio was a thing. The product team is interested in streaming services and Bluetooth speakers, and exploring how KEF fits around this. We’re about high-quality sound – yes, we do the Muo, but that’s only a taste. The real KEF sound is things like the R Series, LS50 and Blade. “Qobuz and Tidal now provide high-quality streaming with MQA, but we’ve tried to make something universal. We want people to enjoy music, and if that’s through Bluetooth we have to live with that. We aren’t saying, ‘you can’t play that, it’s not high enough quality’. We didn’t want to compromise other inputs, so we made a special case for Bluetooth. It sounds worse than the others and we can’t get around that. All the internal processing runs at 24bit/192kHz so, if you feed it something lower, we upscale it to that. Over to you then, streaming world.